The Adept Medical Femoral Access Suite is comprised of the IR Platform and the ArmSure. Clinically driven, designed and manufactured in New Zealand, these lab table accessories offer patient immobilisation and an over-patient worksurface for Vascular, Interventional Radiology and Cardiology procedures. The IR Platform is a stable, radiolucent, height and length adjustable solution for femoral artery procedures. A key feature is its ability to provide operational security due to its positioning above the patient’s legs, whilst still providing a stable yet adjustable surface. The working surface is secured above the patient by locking clips, connecting the legs to the lower-base board, which is placed underneath the mattress. This removes the risk that a distressed patient could dislodge the platform off the table. 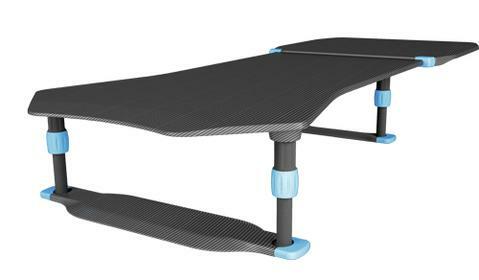 The IR Platform Extension can be clipped and locked onto the end of the table to provide a lengthened work surface, capable of holding longer wires to facilitate over-the-wire and neuro-procedures. This gives clinicians the flexibility to work without the extension for shorter wire procedures and with the extension for longer wire procedures. The ArmSure is designed to gently secure the patients arms into a comfortable position to ensure the sterile field is not compromised during femoral access procedures. It is placed underneath the mattress by simply sliding in the dagger-board. This design allows the straps to be placed loosely around the patients arm and elbow and threaded into the brackets for patient immobilisation. The X-Ray Shield works in conjunction with the ArmSure. It simply slots in and can be adjusted to the optimum position for operator protection from scatter radiation. The ergonomic design of the ArmSure comfortably supports the patients arms at an optimal height, fits all lab table models, works on both sides of the lab table and suits a wide variety of patient sizes.